Let's talk about how swooned I am over this session. 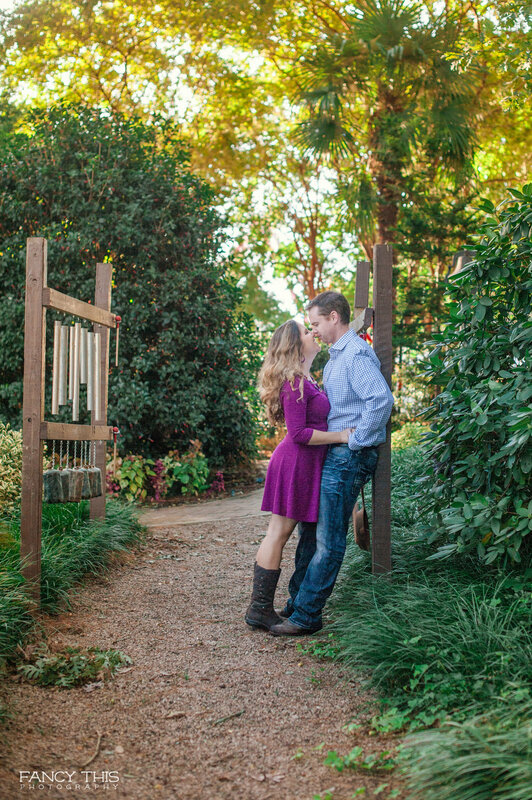 Jayme and Elliott wanted something meaningful to them as part of their engagement session. We threw around a few ideas, and landed immediately on the NC State Fairgrounds. Jayme, as a little girl, would always go to the plant section of the NC State Fairgrounds and spend many memories with her family there. Not only is it a beautiful spot away from the hustle and bustle of the rides, but the mums in particular make the experience so much more magical. If you have never ventured to this part of the fairgrounds, please make sure to do so next year. They are really a sight to see. Before the park even opened, Jayme, Elliott and myself trekked out in the wee morning and found some gorgeous light nestled right there in the nurseries. It was amazing being able to be in the park by ourselves without hundreds of people walking by. Jayme wore this beautiful purple dress and Elliott matched her so well. I had to get a few spinning shots since we were there by ourselves! Jayme and Elliott are tieing the knot next year and I am so over the moon that I will be sharing this day with them as their photographer. Although the engagement session shown below is one that I am so smitten with, I can not wait to show you our sequel in a few short weeks.